TO ACHIEVE THE LOOK: Start with the eyes--pigmented shadows tend to have a lot of fallout and removing it from your freshly applied foundation is a pain. Save the face routine for last and begin by priming the lids with a good primer. Tip: Priming the eyes is the most important step in achieving this type of look. My favorite primer is Urban Decay primer potion , but I also like Too Faced shadow insurance , which comes in a more convenient package. You only need a little of this product, so I highly recommend purchasing one of these options if you want your shadows to last. After priming the lids, you may need an extra base to make the colors more vibrant, and this will depend on the quality of your eyeshadows. I like to use NYX's jumbo eye pencils , blend them roughly and add the eyeshadows on top. 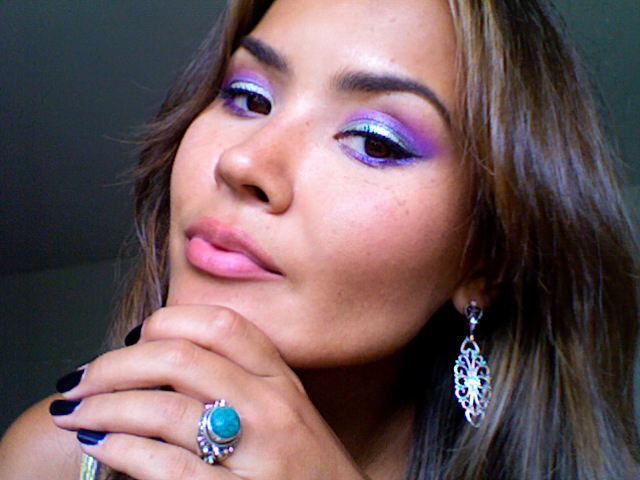 For this look, I used a shimmery white jumbo pencil (Cottage Cheese) all over the lid, and a two-toned bluish purple (Purple) for my crease and under the bottom lashline. I applied the pencil directly onto the lid and blended with my finger. Next, I applied a shimmery minty green shadow with a flat shader brush on top of the Cottage Cheese. Tip: With shimmery shadows, the trick to applying it is to use tapping/patting motions rather than swiping or brushing it on. Doing so will help the shadows stick to your base and create less fallout. If you plan on doing bright eye looks, it's imperative to invest in some quality makeup brushes. Mac's are great but pricy, so go for Sonia Kashuk's brushes , which are decent and can be purchased for a fraction of the cost. For the crease color, I used a fluffy dome-shaped brush and applied a deep pink to the middle of my eye, right in the groove of my eye socket, using windshield wiper motions. If this is new to you, you may want to feel your eye socket first to determine the shadow placement. (o_O) Next, take a finer brush and apply a darker purple eyeshadow directly to your crease and blend upwards with the pink color. Take the same color and apply it underneath the bottom lashline, on top of that purple pencil. Tip: Make sure your crease shadows are matte and not shimmery. Shimmery shadows can cheapen the look if used in the crease and tend to not show up very well on camera. Add a matte pale pink eyeshadow as a highlighter under the brow and blend with the deep pink. Add the same pale pink color to the inner corner, to open up the eye. Finish with black liquid or gel liner on the top of the lashline and add a coat of black mascara. Clean up any eyeshadow fallout and add concealer to hide any dark circles. With a bright eye look, it's important to keep the canvas as flawless as possible, so skipping under eye concealer may not be an option, unless you don't have a dark circle problem like I do. I used my favorite Lancome maquicomplet concealer in Medium Bisque, which is several shades lighter than my skin color and works perfectly for under the eye. I used Bare Minerals matte foundation in Golden Medium to complete my skin routine and lined my lips with NYX's lipliner in Natural. All the eyeshadows came from the Coastal Scents 88 eyeshadow palette , but you can find these palettes on eBay or Amazon from various brands and users. You will be famous one day...i have a good feeling about you. Your make-up tips are very useful! Yes Mash! This is amazing, I'm loving this blog! And damn you must have an arsenal of makeup lol I wish!Fantastique! Love this! Good job Masha! 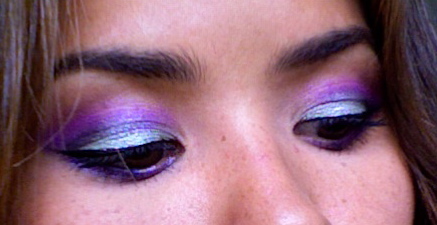 this is definitely my fave of ur make up do's i love when grls can pull off the bright colors n u definitely did!!!! Love love love the eye! sooo dramatic!